Safety and easy transporting is a number 1 priority when working in any type of commercial facility. 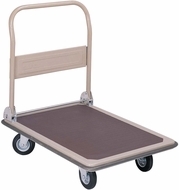 Office Chairs Unlimited thinks it is also and that is why we have as part of our product offering hand trucks. The unique and wonderful feature about these styles is its collapsible and convertible ability. Any selection will be the right choice, holding up to 500 lbs capacity with sturdy steel as a base for the framework.